Different businesses and organizations have different needs when it comes to designing facilities where they can do their best work. That’s why we offer a huge selection of commercial garage doors at O&L Door Systems. This significant selection allows our customers to browse and identify the perfect fit for meeting their needs. Many of our customers are drawn to commercial folding garage doors because of the unique performance they offer. These businesses and organizations include everything from restaurants to fire and police stations. We have the products and team needed to deliver outstanding installation of commercial folding garage doors in Bloomington, Burnsville, Eagan, and nearby communities. Commercial bi-fold garage doors open in a unique upward fashion. Many businesses are drawn to these types of doors because they require little space for operation. That is, they don’t need the clearance space of a traditional door. You can simply raise and lower them as needed without worrying about taking up valuable space in your facility. This is particularly important in a setting like a restaurant, where bi-fold doors don’t mean reducing the number of tables you can set out or crowding walk areas for wait staff and customers. Commercial bi-fold garage doors also help restaurants create transitional areas. You can keep the doors shut during winter and ensure that your customers stay warm, and you can keep them open on beautiful summer afternoons when your guests are seeking an outdoor dining experience. Choose commercial bi-fold garage doors for your restaurant or other business and enjoy flexible spaces, easy installation and simple operation that doesn’t take up any of your valuable square footage. Commercial four-fold garage doors are similar in operation to bi-fold doors, though they often find use at different types of facilities. 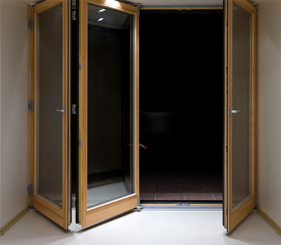 Four-fold doors install vertically and they most often find use at police stations, fire stations, parking garages and similar settings. Why? Because commercial four-fold garage doors offer outstanding security and speed of opening and closing. When you need to close off an area, you can count on four-fold garage doors closing it off securely. When you need to quickly open space for a large car or truck to pass through, four-fold garage doors allow for that fast opening and closing. Commercial four-fold garage doors also provide full visibility. If your garage door opens onto the street, you don’t have to wonder who or what is waiting on the other side after the doors open. When you need installation of commercial folding garage doors in Eagan, Bloomington, Burnsville and surrounding areas, you shouldn’t trust the installation work to just any service provider. While these doors are tough, durable and easy to use, poor installation will undermine that performance. At O&L Door Systems, we work with businesses each day, delivering fast and effective installation of commercial folding doors. Count on our large selection of commercial folding garage doors and on our team’s experience and knowledge in installing them. A garage door is a key appliance at homes and businesses. While you can find cheap, off-the-shelf solutions from discount service providers, this is one investment you don’t want to skimp on. Quality matters in overhead doors, when you’re choosing a new door for your business. You often get what you pay for, which can mean little value when you go with cheap options that can’t get the job done. For more than 20 years, we’ve been serving businesses and homeowners throughout the Twin Cities area. We offer a large selection of commercial garage door products, as well as effective and responsive service you can trust – even in emergencies. You can always depend on the team at O&L Door Systems.